NEW YORK, NY, November 7, 2017 --- Lindblad Expeditions Holdings, Inc. (NASDAQ: LIND; "Lindblad", the "Company"), the global leader of expedition cruises and adventure travel experiences, today announced that it has signed an agreement with Norwegian shipbuilder and ship designer Ulstein to build the world's foremost expedition ship. The state-of-the-art polar vessel has been designed as the ultimate expedition platform with a focus on safety and comfort, as well as incorporating innovative sustainability solutions to reduce its environmental impact. A core feature is Ulstein's signature X-BOW®, a distinctive bow that provides fuel efficiency while significantly improving guest comfort in rough seas; and a very high ice class for access deep into polar regions. The ship's expanded fuel and water tanks provide for extended operations in remote areas; while the zero-speed stabilizers will ensure stability underway, whether at zero speed when stopped for wildlife observation, or embarking/disembarking the ship. "We are incredibly excited to be working with Ulstein and their brilliant team of engineers and designers on this state-of-the-art vessel as we continue expansion of our fleet. 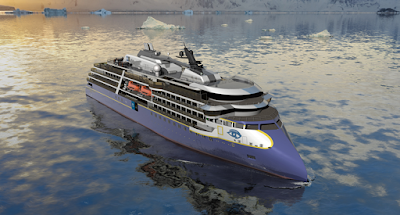 It is the next step in the long-term growth of the company, and will be the most extraordinary global expedition ship in the world on a multitude of levels," said Sven Lindblad, President and CEO of Lindblad. In keeping with the Lindblad Expeditions-National Geographic ethos to connect guests with the environment being explored, the ship will be designed to access the outside environment from anywhere on the ship. With 75% of the cabins featuring balconies for private viewing; multiple observation decks inside and outside, and new "observation wings," the surrounding environs will always be accessible. Off-ship exploring will be greatly enhanced with an innovative Zodiac loading system which will allow everyone to get ashore quickly and safely, ensuring quick access to every destination. The ship's complement of expedition tools for exploration will include kayaks, cross-country skis, a remotely operated vehicle (ROV), hydrophones, a video microscope, underwater video cameras, a helicopter landing platform, and more to be announced in the coming months. The ship will afford gracious comfort and an unparalleled level of service, with the highest comfort class for guests to ensure a quiet and peaceful environment onboard. The 69 spacious guest cabins and suites will include 12 cabins for solo travelers. The spa and fitness area will include treatment rooms, saunas, a fitness room, a relaxation area and yoga room; and there will be two infinity Jacuzzis for the utmost relaxation in pristine environments. Dining offerings include a main restaurant with outstanding views to the surroundings, and an outdoor barbeque and bistro area. "We are pleased to have been chosen as a partner for this exciting project. Lindblad is an innovative company and a frontrunner in the exploration cruise industry. We look forward to turning this project into reality together with Lindblad and their partners," stated Gunvor Ulstein, CEO at Ulstein Group. For more information visit us at www.expeditions.com. For more information visit natgeotv.com or nationalgeographic.com, or find us on Facebook, Twitter, Instagram, Google+, YouTube, LinkedIn and Pinterest.